Looking for a way to post schedules, plan events, or keep track of appointments or meetings? Using printed dry erase calendar boards are a wonderful way to keep yourself organized. Mount these whiteboard planners in corporate environments, conference rooms, home offices, schools, and rec centers. 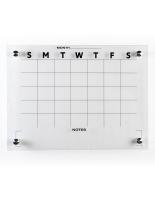 Printed dry erase calendar boards let you create your own agenda, prioritize important tasks, or even delegate shift duties. These wall mounting agenda boards come in multiple sizes to fit your needs, whether it be a smaller 24” x 18” model or a large 48” x 74” unit big enough for the whole office to see. 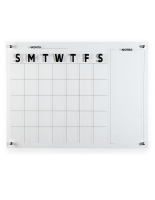 Browse through our selection of dry erase calendar boards to find one best suited for you! Why should I choose whiteboard agendas for organization and planning? 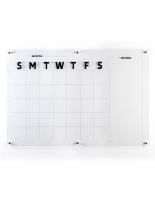 High-Quality Construction: Printed dry erase calendar boards are made from durable acrylic that’s finished with a special coating to give the surface “dry-erase” capabilities. The sturdy material makes it possible for these panels to last for years of use while maintaining a professional appearance. Practical Design: The layout consists of a grid-style agenda, printed with the days of the week and has space for the month of the year to write-in at the top. The design gives users ample space in each square to document notes, appointments, schedules, and due dates. The “blank canvas” style is appealing because it provides a way to manage 12 months out of the year - in a convenient month-by-month format. These acrylic boards even come with an eraser and marker to help get you started! Multiple Size Options: Choose from small and large model options. 24” x 18”, 24” x 36”, 36” x 48”, and 48” x 72” are available. The variety of sizes makes it easy to find the right model for your business, home office, cubicle, school, or conference center. Variety of Applications: Use these anywhere — homes and office environments alike need means of organization. The neutral design template makes it possible for these boards to be used in many ways. Restaurant managers use these to schedule their staffs’ shifts. Camp counselors can post upcoming activities for the week. Organize your workflow, schedule meetings, and complete tasks in the office. The options are endless. Staying organized is important. 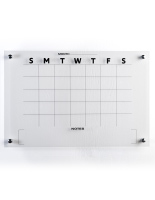 With wall mounted whiteboard agendas, it’s never been easier to keep your schedules and plans in order! Not looking for a calendar option? Tempered glass whiteboards with an open face are a great option for schools and offices for brainstorming and jotting down notes. Shop online at Displays2go for quick shipping and low prices!